The Te Deum laudamus, often called the Ambrosian Hymn because of its association with St Ambrose, is an ancient Christian hymn of joy and thanksgiving. The title translates to We Praise Thee O God. Originally attributed as a collaboration between St Ambrose (c340-397), Augustine of Hippo (c354-430) and Hilary of Poitiers (c310-367), more recent scholarship by the Catholic Forum credits its composition to Nicetas (335-414), Bishop of Remesiana. In any event its composition appears to have occurred during the fourth century and it has been in constant use in the Christian church in the intervening centuries in a number of ways. In the Roman Catholic church it is used at the conclusion of the office of Christmas and Easter, and at the end of Mass on Solemnities and Feast Days. It is also used at the consecration of a Bishop or a religious building, on the election of a Pope and at the canonisation of a saint. In the traditional Anglican church it appears as the first of two canticles at Matins and is also used at the coronation of a monarch. In the Lutheran church it is used under the title Herr Gott dich loben wir. The text consists of 29 verses of prose. The first ten of these are in direct praise of God, addressing the deity directly and listing all who praise and venerate him, from the hierarchy of heavenly creatures, to those Christians already in heaven, and to mortals on Earth. 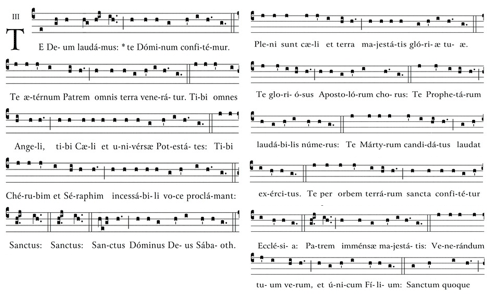 This section also incorporates the words of the Sanctus, from the Mass, in lines 5 and 6. Verses 11-13 are a Trinitarian Doxology. The second section is in praise of Christ, and continues until verse 19. Verses 20 and 21 form a prayer, addressed to Christ. The final lines, thought to have been added later, are petitions with a call and response structure, and are direct quotations from various verses in the Book of Psalms. Liturgically, this final section is often omitted. Broadly speaking the text mirrors, in a poetic way, the sentiments found in the Creed, fusing a declaration of faith with various heavenly visions. As in the Creed, the text covers the origin of Christ, his suffering, death, resurrection and glorification, as well as the redemption of man. The text also asks for mercy over past sins, protection from the temptation of future sin, and hope for reunification with God in the form of eternal life. The first twelve lines of the text, as set in the original plainsong melody.